- featuring new collaborative work by John Tindel, Michi and Alex Feliciano. Fresh from the land of Dixie, Atlanta artists John Tindel and Michi come to Los Angeles to creatively team up with LA artist Alex Feliciano. The Atlanta pair bring with them their southern-fried “folk graffiti” style of painting. 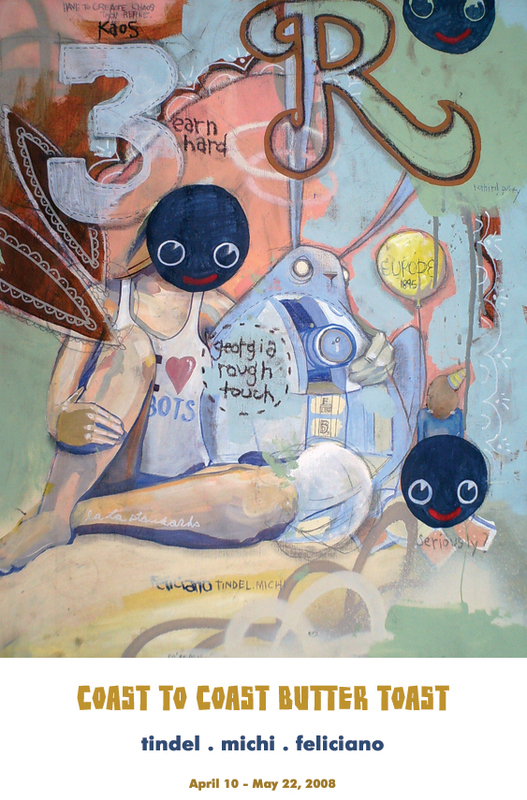 Feliciano's own painting style, though decidedly more surreal, is comparable with its graffiti-based origins. This visual mash-up promises to be a lively celebration bursting with texture and quick witted humor. John Tindel and Michi ("TindelMichi") have been dazzling fellow Atlantans with their collaborative paintings for the past few years. Like many residents of the south, these two proudly embrace their southern identity, often injecting regional humor and folklore into their colorful, multilayered canvases. This practice of infusing their paintings with a delicate sensitivity for southern culture adds an unpretentious quality to their work, yet the overall effect is indeed sophisticated. The artists cite artistic influences from Neo-Expressionism to contemporary Pop, and draw inspiration from urban hip-hop, free form jazz and poetry. TindelMichi’s collaborative method of working plays out less like a duel and more like a dialogue – a point, counterpoint that yields a delightful and refreshing result. Originally from Miami, Alex Feliciano moved to Atlanta in 2000, where he met John Tindel and Michi. Together with others, the group formed the artist collective “The Creative Life.” In 2004, Feliciano moved to Los Angeles, where he lives and works today. Alex Feliciano is largely a self taught artist, who at an early age became immersed in the burgeoning graffiti movement. He strongly believes in the purity and nuance gained from life drawing and painting, as opposed to working from photography or with the aid of computers. He continuously adds to his thousands of pages of sketchbooks, images from his own mind, as well as technical studies of his surrounding environment. The result is a fascinating mix of quirky, humorous imagery, based partly on reality and partly on Feliciano’s very active imagination. His paintings often depict bizarre characters engaging in strange leisure activities, and acting out curious and puzzling tableaus. This manner of creating lends an intriguing and deeply psychological undercurrent to much of his work. Please join Art Murmur Gallery for this visually striking exhibition from three very talented young artists.